The warmer weather means fresh vegetables and an absolute favorite side dish in the Melrose household is my vegetarian recipe for a Summer Vegetable Casserole. I get a little reprieve of cooking in the Spring and Summer because Joe loves to grill. I end up just being put in charge of the side dishes, which is perfect for me. 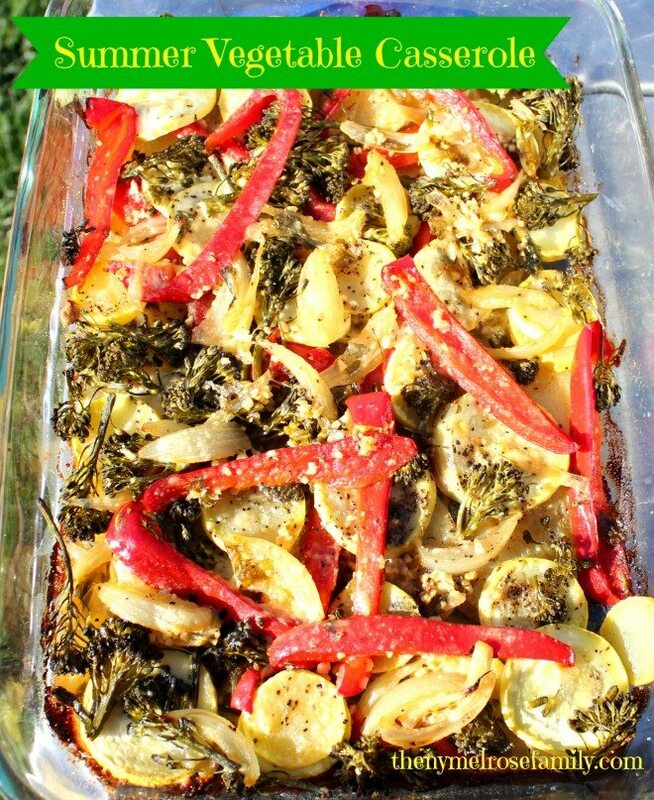 The Summer Vegetable Casserole is simple and easy. Thank you Meghan. I loved yours as well! These veggies look incredible, Jenny! A perfect way for my family to eat more! Awesome contest, really going to have to work on a recipe for that. those vegetables look beautiful! Yum!!! I love to feature good food on my blog… in fact today I’ve got a Mexi-Mexicana Round up going on… hope you can check it out. This looks delicious and now I am officially ready for Summer to get here! Thanks for sharing with us this week at Monday Funday! What a great way to use veggies. It is pretty and different. I especially loved the addition of broccolini. I hadn’t thought to use it like this. Thanks for sharing on Thursdays Treasures. That looks very good – I love that summer vegetables are so versatile that you can just throw them all together and they taste delicious. 🙂 Visiting from Sunflower Supper Club.